fruits | What's Green with Betsy?!? It’s that time of year again; farmers’ markets are back! 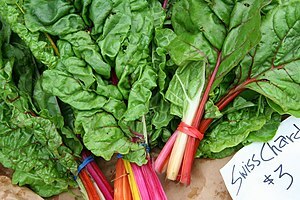 Lettuces, kale, swiss chard, pea greens, radishes, strawberries – there’s lots of early spring produce, especially with greenhouse grown vegetables. You can also get locally raised eggs, meat, and poultry, fresh-baked goods, locally produced cheeses, potted plants and herbs, handcrafted soaps and lotions, and artisanal items. Every week it’s something different. I’m thrilled that the farmers’ market concept has caught on. The average food travels 1500 miles from farm to plate, consuming large quantities of fossil fuels and generating major CO2 emissions. Produce is picked unripe, then gassed to ripen, or processed using preservatives or irradiation, losing important nutritional value. With farmers’ markets, food is grown locally using organic or sustainable farming practices and picked at peak ripeness. Fresh and nutritious, there is nothing tastier than a vegetable or fruit straight from the farm. There are many other advantages. When you shop at a farmers’ market, you are supporting local farmers and the local economy. The farmer sells directly to the customer; middlemen are eliminated and the farmer gets to keep more of his profits. In this era of prepackaged foods, there is little direct connection to our food. At a farmers’ market, you meet and get to know the people who grow your food and they get to know the people who eat the food they grow. Today’s children will grow up understanding that their food doesn’t just come in a plastic bag from a giant supermarket, instead someone actually plants the seeds, cares for the tender plant and then harvests the fruit or vegetable. Farmers’ markets bring the community together; they are a place for neighbors and friends to connect. Participating local musicians, food trucks, art shows, and children’s activities make food shopping a real event. Local farms help preserve open space, protect the land and promote healthy ecosystems. With sustainable farming, the soil isn’t contaminated with toxic chemicals, keeping our waterways safe. I participated in the Mashpee farmers’ market on Cape Cod last weekend answering green living questions. Shoppers and vendors were happy, enjoying the warm summer day. Customers chatted with the farmers and admired the fruits of their labor. One vendor even sings opera! Farmer’s markets provide an old-fashioned respite from our fast-paced, wired lives. So, take a break and visit the farmers’ market in your town. You’ll enjoy more than the delicious and nutritious produce grown in your area, you’ll enjoy the whole experience. If you are in the Mashpee area on Cape Cod, stop by the Farmers’ Market at the Mashpee Commons and say hi. I’m there most Saturdays – the market runs from 1:30 – 6:00! Some information compiled from winchesterfarmersmarket.org. I recently attended a raw food cooking class. A raw food diet is just what it says – food that is eaten raw or heated to no more than 115 degrees. According to raw food experts, the advantages are that raw food contains beneficial live enzymes that make it more digestible and that it has a higher vitamin and nutrient content. Heating or cooking chemically alters food causing it to lose its ability to provide energy. Cooking also destroys certain vitamins. A raw food diet can cleanse and heal. The raw food diet as a health treatment was first developed in Switzerland in 1897 by Dr. Maximillian Bircher-Benner, the inventor of muesli, after he recovered from jaundice by eating raw apples. His health center is still in operation today. In summer when fruits and vegetables are abundant, preparing seasonal, local, raw food is easy. A strict raw food diet year round however, is more involved and does not include any processed foods. To make crackers, breads and other “baked” goods can be time consuming and requires advance planning. Blenders, food processors, juicers and dehydrators are all needed equipment. Sprouting and soaking are necessary to eat grains, legumes and nuts. Nuts are a large part of the raw food diet and are used to make cheeses, crackers, breads and soups. What appealed to me about the class was its emphasis on creating warming uncooked meals. We learned simple tips like bringing all food to room temperature for a couple of hours before preparation and using lots of warming spices like cumin, curry and nutmeg. Our meal started with a delicious raw butternut and green apple soup, followed by zucchini chive canapés, a zucchini slice smeared with chive cream cheese made from cashews – even better than “real” cream cheese! For dinner we made a Brussels sprout and pumpkin seed slaw, a wild rice and chickpea salad, kale and shallot pizzettes with 3 kinds of cheese (again, cashew based; the crust was made from flax seeds and vegetables “baked” in a dehydrator) and a fresh fig and lemon tart for dessert. The dinner was fabulous and you never would have known it was uncooked! Grind cashews and sea salt in food processor (with ‘s’ blade) until fine, almost powdery. Add garlic and pulse food processor until texture resembles Parmesan. Use on everything! Information compiled from The Raw Truth, The Art of Loving Foods, by Jeremy A Safron and Renée Underkoffler, http://en.wikipedia.org/, onesmallpatch.com. I’m a firm believer in learning from other people’s expertise, experiences, wisdom and even well founded opinions. This weekend I attended Be Healthy Boston, a 2-day urban wellness retreat with keynote sessions and workshops. It was fabulous! Renowned doctors, naturopaths, nutritionists, physical therapists, psychologists, architects, designers, chefs, musicians, yoga instructors and green living experts, shared their knowledge with eager people who wanted a healthier lifestyle. I’d like to share some of this knowledge with you. One main message was empowerment. The resources to manage your own health and well-being are plentiful – we are lucky in the Boston area to have access to so many health care professionals of all levels – and there is no lack of information on the Internet. One session that I especially enjoyed was “Food as Medicine” given by Dr. Mark Mincolla, a nutritional and natural health therapist who has transformed the lives of thousands of patients over the past 30 years. He spoke extensively about inflammation, the root of many diseases including cancer, heart disease, diabetes, allergies, autoimmune diseases, arthritis, and others, and how we can control chronic inflammation through diet, exercise and stress reduction. Dr. Mincolla suggests trying an anti-inflammatory diet for three weeks (give yourself a break on the weekends if it seems impossible) just to see if you feel any difference, which consists of: fatty fish like salmon, vegetables, fruits, legumes, brown rice (whole grains), olive oil, soy, tofu, walnuts, pumpkin seeds and yeast-free bread. Eliminate inflammatory foods such as dairy, wheat, egg yolks, fatty red meats, sugar and alcohol. The anti-inflammatory foods, high in Omega-3 essential fatty acids, are an extremely important part of disease prevention and overall health. I urge you to read more about inflammation or visit his website maxhealing.com to better understand the inflammation/disease connection. Check out his NECN program called “You Are What You Eat”. An irony of all ironies – I picked up a flu bug from the Be Healthy Boston retreat! Life is funny…. Some information compile from “Food is Medicine” by Dr. Mark Mincolla.